Facebook is closing in on the 500 million monthly unique visitors mark. 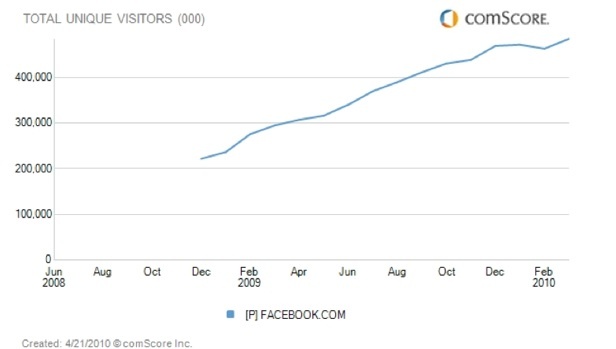 The social network saw 484 million unique visitors worldwide in March, 2010, according to comScore’s latest estimate. That number is up 64 percent from a year ago, and up 22 million from just February, 2010. In other words, it grew by about the size of Twitter.com’s entire U.S. audience in a single month. (ComScore puts Twitter’s worldwide audience at 79 million people). These estimates are different than Facebook’s official number of registered users, which it last updated in february when it hit 400 million. At its F8 conference for developers today it might update that number to 450 million or more. (We’ll see, stick around for live coverage). 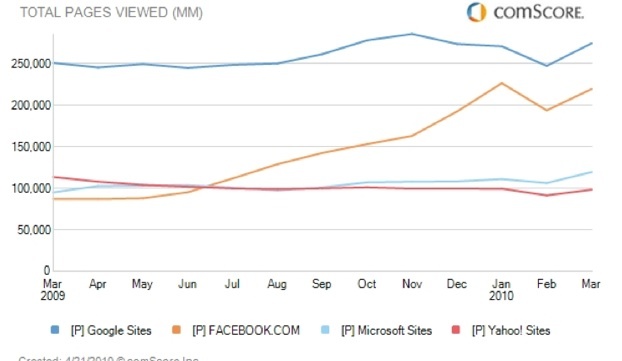 The comScore numbers tend to be bigger than Facebook’s official numbers which makes sense since not every visitor to Facebook’s site is necessarily a registered user. Worldwide pageviews are up more than 150 percent to 220 billion a month (more than Yahoo or Microsoft). On average, across all visitors, people log in 11 times a month, up from 8.5 times a month a year ago. Total time spent on the site is 134 billion minutes/month, or about 7.5 percent of all time spent on the Internet.